It’s Friday! Now I know that this day is one of great delight to humans who leave their felines at home and go to that place called “work” but for us cats, it’s just another day, As far as we are concerned, every day is Caturday. I’m doing this week’s fill ins and I hope you enjoy my answers. 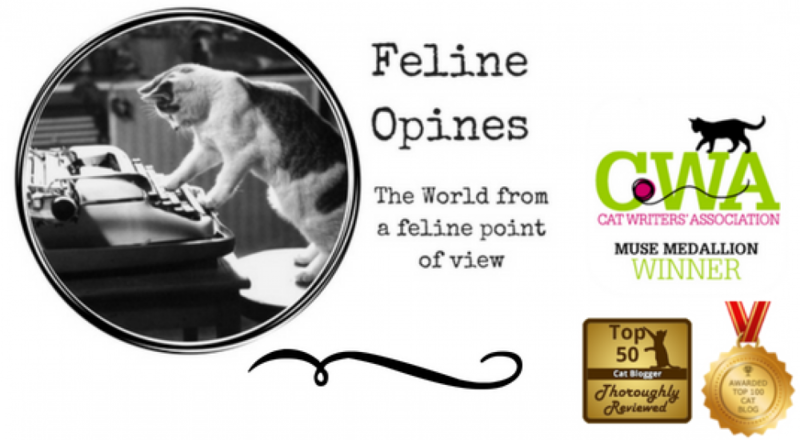 You can purrticipate by heading over to the hosts, 15andmeowing or Four Legged Fur Balls and join the blog hop. You are always welcome to opine about your fill in answers in the comment section of this blog post too. 2. Yesterday, I spent a great deal of time attending to my luxurious and immaculately white fur. Looking this good takes a lot of work! 3. My favorite place to be is anywhere there is sun or warmth. Even in the summer I like to find a warm, sunny spot. 4. If I was granted one wish, it would be that every kitty would find a furever home! Alberto and I as well as the rest of The Tribe were adopted. These are our kitten pictures from our Adopt a Cat Month post. This entry was posted in adopting kittens, animal shelters, Cat adoptions, cat behavior, Cat blogs, Cat Travel, Cat Writers Muse Award winning blog, cats, kittens, Pet blogging, shelter cats, Top 50 Cat Bloggers and tagged adopting cats, adopting kittens, Alberto, Devotional for cat lovers, Felines Opine on God, fostering kittens, Oliver, The Tribe of Five by Feline Opines. Bookmark the permalink. Great answers, Oliver! It’s interesting that both you and Purrseidon had similar answers for #1 – her answer was faith in purrayers, which – to my way of thinking – is only a step away from faith in God, since that is who those purrayers are directed at. Thank you for joining in on the Friendly Fill-Ins, Oliver! Your answers are so purrfect. That stunning photo of you in the sun has us craving some sun puddles. We’re going to go look for some. Purrs and happy Friday to you! Great answers! You are looking good for sure! Rescue is the best breed! I love that stair shot! 1. I have faith in God. 2.Yesterday I slept most of the day and tried to find a sunbeam to lay in. 3. My favorite place to be is anywhere I want to be. 4.If I was granted one wish it would be that all animals get a furever home. Amen to #1! Number 2 is something we strive for . Couldn’t agree more with #3. Two paws up for #4! Why thank you! You really need to stretch out on your back and watch the birds fly by. It’s a lazy cat’s purrfect activity! Keeping the white fur nice and clean is a challenge, but you are up to the challenge, Oliver! Why thank you, I work hard at it! Why thank you (and thank you for getting our book, it’s greatly apurreciated!